Microsoft OneNote 2010 offers several new features in addition to improvements and enhancements to features introduced in previous versions. This article summarizes the most significant changes to help you plan your upgrade. With OneNote 2010, you have virtually uninterrupted access to your notes and information by providing the ability to access your files from anywhere you are — whether at work, at home, or on the go. Sync to the cloud (OneDrive) Your notebooks are available anywhere from any computer. This is in addition to the other ways you can sync your notebooks (file shares, SharePoint, USB drives, etc.). OneNote Online You can access and edit an entire notebook from a Web browser, even on computers that don't t have OneNote 2010 installed. OneNote Mobile 2010 for Windows Phone 7 If you have Windows Phone 7, you can use Microsoft Office Mobile 2010 to work with your notes from anywhere—whether you’re at work, at home, or on the go. OneNote Mobile 2010 is part of Office Mobile and already on your phone in the Office hub, so you don't need to download or install anything else to get started. You can use OneNote Mobile to create or update notes using many of the same tools you’re familiar with in the desktop version of OneNote, such as inserting voice memos and pictures into your notes, viewing notes and locating specific pages in a notebook, creating lists, and opening and editing notebooks that are stored on a SharePoint 2010 site. 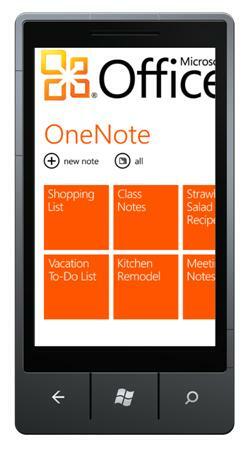 You can also add notes to a OneNote notebook that was created for you and synced to OneDrive. This way, you can view and edit your notes on your phone using OneNote Mobile, on your computer using OneNote 2010, or online using OneNote Online in a web browser. OneNote 2010 supports simultaneous multi-user editing of notebooks. This is useful for single users who want to work with the same notebook on both a desktop and a laptop computer simultaneously without locking the file, but it's even more valuable for groups and teams who are sharing a notebook for brainstorming, planning ideas, capturing information in meetings, and so on. Shared notebooks are also useful for families who can use it for planning home renovations, gardening, recipes, wedding and event planning, and so on. Highlighting of unread notes New content in a shared notebook that someone else in your group or on your team has added or changed since you last looked at it is automatically highlighted so you can quickly see what's new. Notebook tiles, section tabs, and page tabs containing new content are shown in bold so you can quickly navigate to it. Authoring information Content added or changed in a shared notebook by anyone other than you is now indicated by a small, color-coded bar with the author's initials. You can now easily see who added new information — and where. Versioning support You can now quickly show previous versions of any page, including who wrote it and when. Changes relative to previous versions of a page are automatically highlighted. Faster synchronization of pages When multiple people are working on the same page, synchronization of that page is accelerated so that changes appear to all authors in near real-time. Making it easy to capture, organize, and finding information has always been at the heart of what OneNote does. OneNote 2010 offers several enhancements in this core feature area. Section and page tab improvements OneNote 2010 makes navigation of notebooks with a larger number of sections and pages simpler than before, and it is now easier to create new sections. Additional enhancements include better visualization of the page tab hierarchy, the ability to collapse groups of subpages, and the ability to insert new pages from anywhere in your page tabs. Fast Search for easy navigation There has never been a faster way to get to the most often used pages in your notebook. Search results appear as you type. In addition to page content, Fast Search can search based on notebook names, section labels, and page titles. Page authors can also quickly search for recently added content (last day, week, month, and so on) or get a quick overview of what's changed on any particular day. Wiki linking You can now easily create a link to any existing page in a notebook (or even to a new page) by simply typing the Wiki link syntax — for example, [[The Page Title That I Want]] — or by using the new page search experience from within the Insert Hyperlink dialog box. This enables you to easily create Wiki like notebooks with lots of cross links across pages. Quick filing You can import information into OneNote in a variety of ways, including Send to OneNote from Microsoft Outlook and from Windows Internet Explorer, and you can print any document or file directly to your notebook using the OneNote print driver. The new Quick Filing popup in OneNote 2010 lets you quickly choose where in your notebook you want to import something. To make repeated importing easier, this feature remembers the last places from where you imported content. You can also search in your Quick Filing locations to find a specific section or page if you want to move it to a different location. OneNote is ideally suited as an indispensable companion when researching and collecting information from other files or on the World Wide Web (for example, a market analysis study, a class paper, home renovation options, a car purchase, hotel and flight information, and so on). This often involves looking at a variety of Web pages and related documents and annotating them. We've enhanced a number of features in this category to improve this experience. Docked OneNote You can now move the OneNote program window to the side of your Windows desktop, where it docks alongside other windows (for example, your Web browser, other Microsoft Office programs, and so on). OneNote minimizes the user interface and shows you only your current page alongside the other windows. Linked Note Taking While in docked mode, OneNote 2010 can automatically link the notes you take to what you're looking at — such as a Web page address in Internet Explorer, the cursor location in Microsoft Word, a specific presentation slide in Microsoft PowerPoint, and so on. When you later return to OneNote and hover over a linked note, you'll see a thumbnail preview of the original document, which you can click to be taken back to what you were looking at when you wrote the note. Automatic text wrapping OneNote now wraps text outlines to automatically fit the window size when there is only one outline on the page (for example, when the OneNote program window is docked to a relatively narrow window on the side of your desktop). IRM protected printouts In corporate enterprise and training scenarios, you can now more safely distribute intellectual property and proprietary materials such as product manuals or lecture notes. Recipients of protected notes can view such content in OneNote 2010 and annotate them with their own, personal notes. Unauthorized recipients will not see any of the protected material. Print driver for 64-bit operating systems OneNote 2010 is the first version of OneNote to offer a native Send to OneNote print driver that fully supports 64-bit versions of the latest operating systems, such as Windows Vista and Windows 7. Much like OneNote's organizational features, its editing capabilities are a core feature area. OneNote 2010 offers several enhancements here as well. Gallery of basic Styles OneNote 2010 adds a quick gallery of basic note-taking styles, such as Heading 1, 2, 3. While not intended to match the complexity of a word processor's style gallery, these basic styles provide a quick and easy way to apply a consistent structure and appearance to recurring types of notes (for example, class or meeting notes). Improved bulleted lists A simple but much requested change, the indentation of first-level bulleted items in a list now exactly matches the indentation of the previous text. Mathematical equations OneNote 2010 supports the ability to add equations. This is useful for students or anyone else who needs to input math as part of their notes. This feature is further enhanced on Tablet PCs running Windows 7, where OneNote can recognize and convert handwritten mathematical equations in addition to typed ones. Mini Translator A new Mini Translator in OneNote 2010 lets you use your mouse to point to a foreign word or phrase and see a translation into your native language in a small window. This is useful for language students, or anyone working in a bi- or multi-lingual environment and needs help understanding a word or phrase (for example, from text in a shared notebook or from clipped content from the Web). The Mini Translator includes a Play button so you can hear the audio pronunciation of the word or phrase, as well as a Copy button so you can paste the translation elsewhere in your notebook. No language packs, language interface packs, or proofing tools need to be installed on your computer for this feature to work. The already well-established popularity of OneNote among Tablet PC users makes its newly added support for touch-enabled operating systems such as Windows 7 a natural progression. Finger panning and auto-switching On compatible computers running Windows 7, you can use your finger to scroll and pan around any page in OneNote 2010. Depending on your input device, OneNote will automatically switch between pen, pan, and selection. Pinch zooming This is a standard gesture on multi-touch devices, such as a PC running a touch or multi-touch compatible operating system such as Windows 7. By using a pinch gesture with your fingers, you can zoom in and out of a notebook page in OneNote to change the page magnification to your liking. Improved navigation controls Several navigational enhancements have been added for customers using OneNote 2010 on touch-compatible PCs and operating systems. Like the other Microsoft Office 2010 programs, OneNote 2010 includes the Fluent™ interface, which consists of a fully customizable visual system of tools and commands. Ribbon access The Ribbon provides easy access to the tools and commands in OneNote. It replaces the toolbars seen in older versions of Microsoft Office programs. The Ribbon in OneNote was designed to optimize for key note-taking scenarios to make them easier to use. The Ribbon provides quicker access to the full well of commands in OneNote 2010 and allows for easier future additions and customizations. To help maximize your note-taking space on the page, the Ribbon can be hidden while writing and revealed only temporarily when needed. Ribbon customization You can use customizations to personalize the Ribbon in OneNote 2010 with the tools and commands that you care most about. You can also create custom tabs and custom groups that can provide shortcuts to your most frequently used commands. Microsoft Office Backstage view A new addition in Microsoft Office 2010 programs, the Microsoft Office Backstage is the latest innovation in the Microsoft Office Fluent user interface and a companion feature to the Ribbon. The Backstage view is where you manage your files and set your program and notebook options. Simplified language settings Multilingual users can easily access a single dialog box in OneNote 2010, where preferences can be set for editing, display, ScreenTip, and Help languages. If you don't have the software or keyboard layout installed that you need, you are notified, and links are provided for you to make it easier to resolve such issues.